● The Cisco 2900 Series ISRs offer increased levels of services integration with voice, video, security, wireless, mobility, and data services, enabling greater efficiencies and cost savings. ● A single Cisco IOS® Software Universal image is installed on each ISR G2. The Universal image containsall of the Cisco IOS technology sets which can be activated with a software license. This allows your business to quickly deploy advanced features without downloading a new IOS image. Additionally, larger default memory is included to support the new capabilities. ● The Cisco Services Ready Engine (SRE) enables a new operational model which allows you to reduce capital expenditures (CapEx) and deploy a variety of application services as needed on a single integrated compute services module. ● The Cisco 2900 Series enables deployment in high speed WAN environments with concurrent services enabled up to 75 Mbps. ● A multigigabit fabric (MGF) enables high-bandwidth module-to-module communication without compromising routing performance. ● Designed to address customer business requirements, the Cisco 2900 Series modular architecture offers increased capacity and performance as your network needs grow. ◦ The Cisco 2900 Series offers intelligent power management and allows the customer to control power to the modules based on the time of day. Cisco EnergyWise technology will be supported in the future. ◦ Services integration and modularity on a single platform performing multiple functions, optimizes raw materials consumption and energy usage. ◦ Platform flexibility and ongoing development of both hardware and software capabilities lead to a longer product lifecycle, lowering all aspects of the total cost of ownership, including materials and energy use. ◦ High efficiency power supplies are provided with each platform. ◦ Reuse of a broad array of existing modules supported on the original Integrated Services Routers provides a lower cost of ownership. ◦ A rich set of Cisco IOS Software features carried forward from the original Integrated Services Routers and delivered in a single universal image. ◦ Flexibility to adapt as your business needs evolve. 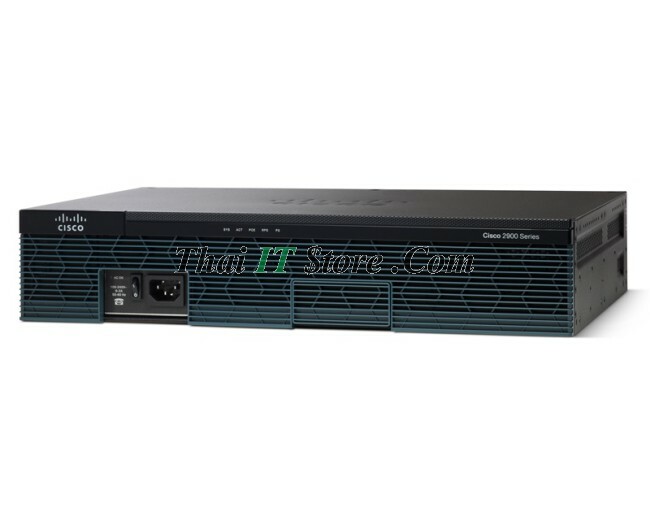 ● The Cisco 2900 Series ISRs are highly modular platforms with several types of module slots to add connectivity and services for varied branch-office network requirements. ● The ISRs offer an industry-leading breadth of LAN and WAN connectivity options through modules to accommodate field upgrades for future technologies without requiring a platform replacement. ● The Cisco 2900 Series are powered by high-performance multi-core processors that can support the growing demands of high-speed WAN connections to the branch-office while also running multiple concurrent services. ● Embedded hardware encryption acceleration is enhanced to provide higher scalability, which combined with an optional Cisco IOS Security license, enables WAN link security and VPN services (IPSec acceleration). ● The onboard encryption hardware replaces and outperforms the advanced integration modules (AIMs) of previous generations. ● The Cisco 2900 Series introduces an innovative multigigabit fabric (MGF) that allows for efficient module-to-module communication, enabling tighter services interactions across modules while reducing the overhead on the route processor. ● Unified communications services in the branch office are significantly enhanced with the use of a TDM interconnectivity fabric in the system architecture, allowing for scaling of DS-0 channel capacity. ● All onboard WAN ports are 10/100/1000 Gigabit Ethernet WAN routed ports. ● One of the three 10/100/1000 Ethernet WAN ports on the Cisco 2921 and 2951 supports Small Form-Factor Pluggable (SFP)-based connectivity in lieu of a RJ-45 port and enabling fiber connectivity. ● A new, innovative USB console port offers management connectivity for devices without a serial port such as modern laptop computers. ● An optional upgrade to the internal power supply provides inline power (802.3af-compliant PoE and Cisco Inline Power) to integrated switch modules. ● On the Cisco 2911, 2921, and 2951, an optional DC power supply is available that extends deployment into central offices and industrial environments. ● On the Cisco 2911, an optional DC-PoE power supply is available. ● The Cisco 2911, 2921, and 2951 allow for power redundancy through the use of an external RPS device, thereby decreasing network downtime and protecting the network from power-supply failures. 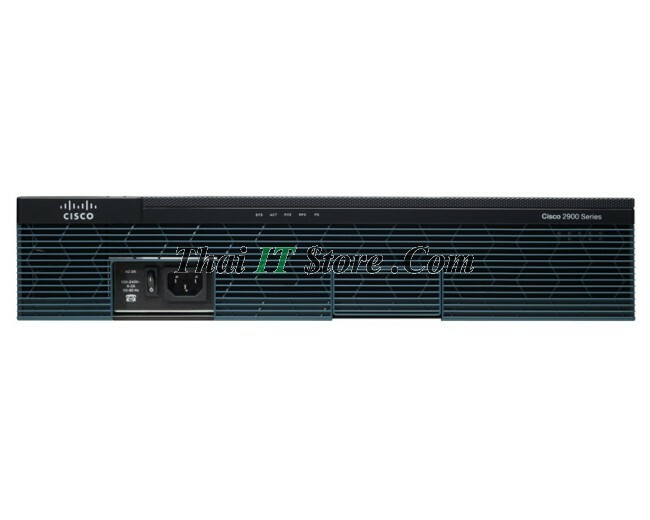 ● Redundant power on the Cisco 2900 Series is supported through the Cisco RPS 2300 Redundant Power System. You can use the Cisco RPS 2300 to provide redundant power for Cisco 2900 Series ISRs as well as Cisco Catalyst® switches. ● In order to use the Cisco RPS 2300, an external RPS adapter is required (configurable option) to connect the platform to the external RPS. ● When connected to an external RPS device, the Cisco 2911, 2921, and 2951 can operate in a PoE boost configuration in lieu of redundant power mode - whereby the power capacity of the platform is increased to twice the normal level to power additional PoE ports. ● The Cisco 2911 and 2951 are designed for NEBS environments. ● The 2911 is 12” deep and has an optional fan filter for deployments in a variety of environments. An assembly that provides front-to-back airflow is also available for 23” racks. ◦ Up to 4 Gbps aggregate toward the route processor. ◦ Up to 2 Gbps aggregate to other module slots over MGF. ● Service module (SM) slots are highly flexible with support for double-wide service modules (SM-Ds), which are Service Modules that require two SM slots. SM-Ds in the Cisco 2921 and 2951 provide flexibility for higher-density modules. ● A service module slot replaces the network module and the extension module for voice/fax (EVM) slots and is offered on Cisco 2911, 2921, and 2951 ISRs. ● Service module slots provide twice the power capabilities relative to the network-module slots, allowing for flexibility for higher-scale and better-performance modules. ● Power to service module slots can be managed by extensions similar to the Cisco EnergyWise framework, so your organization can reduce energy consumption in your network infrastructure. Full EnergyWise support will be available in future software releases. ● The EHWIC slot provides enhancements to the prior generation’s high-speed WAN interface card (HWIC) slots while provide maximum investment protection by natively supporting HWICs, WAN interface cards (WICs), voice interface cards (VICs), and voice/WAN interface cards (VWICs). ● Four integrated EHWIC slots on the Cisco 2901, 2911, 2921, and 2951 allow for more flexible configurations. ◦ Up to 1.6 Gbps aggregate toward the route processor. ◦ Up to 2 Gbps aggregate to other module slots over the MGF. ● Flexibility to support double-wide modules is enabled by combining two EHWIC slots. Up to 2 doublewide HWIC (HWIC-D) modules are supported. ● Power to ISM slots can be managed by extensions similar to the Cisco EnergyWise framework, so your organization can reduce energy consumption in your network infrastructure. Full EnergyWise support will be available in future software releases. ● Each PVDM3 slot connects back to the system architecture through a 2 Gbps aggregate link through the MGF. ● Power to the PVDM slots can be managed by extensions similar to the Cisco EnergyWise framework, so your organization can reduce energy consumption in your network infrastructure. Full EnergyWise support will be available in future software releases. ● Two external Compact Flash slots are available on the Cisco 2900 Series Integrated Services Routers. Each slot can support high-speed storage densities upgradeable to 4 GB in density. ● Two high-speed USB 2.0 ports are supported. The USB ports enable secure token capabilities and storage. Cisco 2900 Series Integrated Services Routers deliver innovative technologies running on industry-leading Cisco IOS Software. Developed for wide deployment in the world's most demanding enterprise, access, and service provider networks, the Integrated Services Routers Generation 2 platforms are supported on Cisco IOS Software releases 15M&T. Release 15.0(1)M is available immediately and provides support for a comprehensive portfolio of Cisco technologies, including the functionality and features delivered in releases 12.4 and 12.4T. New innovations in 15.0(1)M span multiple technology areas, including security, voice, high availability, IP Routing and Multicast, quality of service (QoS), IP Mobility, Multiprotocol Label Switching (MPLS), VPNs, and embedded management. A single Cisco IOS Universal image encompassing all IOS technology feature sets is delivered with the platforms. You can enable advanced features by activating a software license on the Universal image. In previous generations of access routers, these feature sets required you to download a new software image. Technology packages and feature licenses, enabled through the Cisco software licensing infrastructure, simplify software delivery and decrease the operational costs of deploying new features. 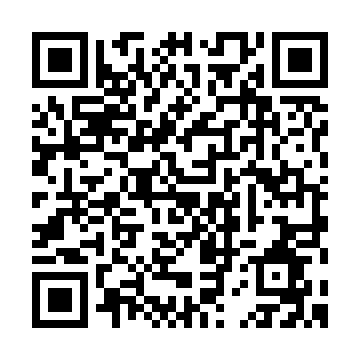 ● IP Base: This technology package is available as default. The Cisco Integrated Services Routers are industry-leading platforms that offer unprecedented levels of services integration. Designed to meet the requirements of the branch office, these platforms provide a complete solution with voice, video, security, mobility and application services. Businesses enjoy the benefit of deploying a single device that meets all their needs, reducing capital and operational expenses. The Cisco 2900 Integrated Services Router is the foundation for collaboration in the small and midsize branch office, serving as a critical component of a Cisco's video architecture (Medianet) and enterprise Unified Communications solution. With embedded voice services and a wide range of supported telephony interfaces, the Cisco 2900 Series delivers maximum deployment flexibility for the distributed enterprise. Unified communications is enabled through a rich signaling and media-processing infrastructure, including a variety of protocols, media interworking, signal and media security, transcoding, conferencing, and QoS. Cisco Integrated Services Routers also feature a wide range of voice-gateway interfaces, supporting a broad array of signaling and physical network interfaces. The Cisco 2900 Series enables a full range of existing and emerging video services, with scaling improvements to support Cisco TelePresence®conferencing, security, and session control. The Cisco Unified Border Element extends these capabilities for business-to-business TelePresence communications. The Cisco 2900 Series adds support for the new Cisco High-Density Packet Voice Digital Signal Processor (DSP) Module (PVDM3), which has been optimized for voice and video support. The new PVDM3 modules support all voice-gateway functions of earlier generations of PVDMs and add higher density and more processing power to support emerging rich-media applications. 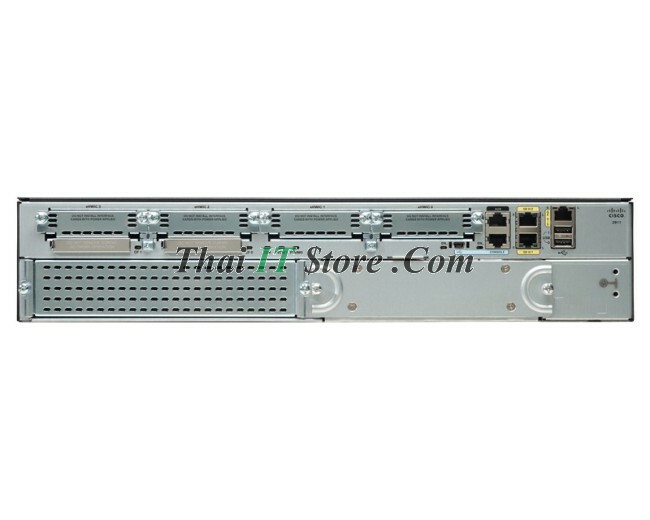 The Cisco 2900 Series provides 2 or 3 onboard PVDM3 slots, depending on the platform. The Cisco Integrated Services Routers natively provide optional unified communications services within the Cisco IOS Software, minimizing the IT hardware footprint and total cost of ownership at the branch office. Cisco Unified Communications Manager Express (CME) provides a broad range of IP private-branch-exchange (PBX) and key-system features integrated into the router for the small and midsize branch office. Cisco Survivable Remote Site Telephony (SRST), also inherently available in Cisco IOS Software, and an option on the Cisco 2900 Series, helps ensure that branch-office employees have uninterrupted telephony services and features, even if the connection to a centralized Cisco Unified Communications Manager is disrupted. Coupled with Cisco Unity® Express, the integrated solution for voicemail, Automated Attendant, and interactive voice response (IVR), the Cisco 2900 Series offers the branch office a complete range of unified communications services while delivering industry-leading security within a single platform. The Cisco 2900 Series also supports standards-certified VoiceXML browser services. VoiceXML is an open-standard markup language used to create voice-enabled web browsers and IVR applications. Just as HTML enables you to retrieve data with a PC, VoiceXML enables you to retrieve data using voice or dual-tone-multifrequency (DTMF) telephony input. The Cisco 2900 Series can deliver a much higher range of concurrent voice-gateway services combined with VoiceXML browser services, for up to 200 sessions on the Cisco 2951. The Cisco Unified Border Element capabilities supported on the Cisco 2900 Series address the emerging requirements in an IP-centric interconnect for branch-office unified communications between enterprises and service provider networks. Cisco Unified Border Element provides intelligent border-element functions such as physical and logical ingress and egress demarcation points, signaling and media control, and consolidated security and management features. The Cisco 2900 Series supports higher scale than previously provided on the Cisco 2800 Series, up to three times the number of sessions. Security is essential to protect a business’ intellectual property while also ensuring business continuity and providing the ability to extend the corporate workplace to employees who need anytime, anywhere access to company resources. As part of the Cisco' SAFE architectural framework that allows organizations to identify, prevent, and adapt to network security threats, the Cisco 2900 Series Integrated Services Routers facilitate secure business transactions and collaboration. Detailed information about the security features and solutions supported on the Cisco 2900 Series is available at http://www.cisco.com/go/routersecurity. The Cisco Integrated Services Routers supporting the Cisco Unified Wireless Architecture enable deployment of secure, manageable wireless LANs (WLANs) optimized for remote sites and branch offices, including fast secure mobility, survivable authentication, and simplified management. The Cisco Wireless LAN Controller Module on the Cisco 2900 Series allows small and medium-sized businesses (SMBs) and enterprise branch offices to cost-effectively deploy and manage secure WLANs. Cisco Wireless LAN Controllers work in conjunction with Cisco lightweight access points and the Cisco Wireless Control System (WCS) to provide system-wide WLAN functions, managing up to 6, 12, and 25 access points. Cisco third-generation (3G) wireless WAN (WWAN) modules combine traditional enterprise router functions, such as remote management, advanced IP services such as voice over IP (VoIP), and security, with mobility capabilities of 3G WAN access. Using high-speed 3G wireless networks, routers can replace or complement existing landline infrastructure, such as dialup, Frame Relay, and ISDN. Cisco 3G solutions support 3G standards High-Speed Packet Access (HSPA) and Evolution Data Only/Evolution Data Optimized (EVDO) providing you with a true multipath WAN backup and the ability to rapidly deploy primary WAN connectivity. For more information about 3G solutions on Cisco Integrated Services Routers, please visit http://www.cisco.com/go/3g. The Cisco 2900 Integrated Services Routers (Cisco 2911 through Cisco 2951) support the new Cisco Enhanced EtherSwitch® Service Modules, which greatly expand router capabilities by integrating industry-leading Layer 2 or Layer 3 switching with feature sets identical to those found in the Cisco Catalyst 2960 and Catalyst 3650-E Series Switches performing local line-rate switching and routing. The new Cisco Enhanced EtherSwitch Service Modules take advantage of the increased power capabilities on the Cisco 2900 ISRs. Additionally, the Cisco Enhanced EtherSwitch modules enable the newest Cisco power initiatives, Cisco EnergyWise, Cisco Enhanced Power over Ethernet (ePoE), per-port PoE power monitoring, and RPS-enabled PoE boost. These technologies allow you to meet increased endpoint power requirements without increasing the total power consumption of the branch. As organizations continue to centralize and consolidate their branch-office IT infrastructure in an effort to reduce cost and complexity, they are challenged to provide an excellent user experience, ensure continuous service availability, and deliver business-relevant applications when and where they are needed. To address these challenges, the Cisco 2900 Series provides the capability to host Cisco, third-party, and custom applications on a portfolio of high-performance Cisco Services Ready Engine (SRE) modules that transparently integrate into the router. The modules have their own processors, storage, network interfaces, and memory that operate independently of the host router resources, helping to ensure maximum concurrent routing and application performance while reducing physical space requirements, lowering power consumption, and consolidating management. The Cisco 2900 Series seamlessly combines industry leading security, IOS-based traffic control and visibility, with Cisco application acceleration solutions. Cisco IOS Software features such as NBAR, IP SLA, and NetFlow provide visibility and monitoring of traffic patterns and application performance while IOS features such as QoS, ACLs, and PfR intelligently control the traffic to maximize the quality of the user experience and employee productivity. The user experience can be further enhanced through the addition of a Cisco WAAS Network Module which can be used to securely provide more advanced WAN optimization techniques such as TCP optimization, caching, compression, and application acceleration. Cisco Integrated Services Routers combined with Cisco WAAS Network Modules, provide optimal performance for applications delivered from a central data center to branch-office users. The solution allows you to consolidate costly server, storage, and backup infrastructure into data centers while maintaining LAN-like service levels for remote users. The Cisco Services Ready Engine solution is available in a Service Module (SM) and Internal Service Module (ISM) form factor. The Service Module hardware offers up to a seven times performance improvement over the previous generation Network Modules and provides a multi-core x86-64 processor. The SRE modules also support up to 1 terabyte of storage, RAID configurations, hardware-assisted virtualization and cryptography options. The Cisco SRE module enables on-demand provisioning of branch-office applications on the Cisco 2900 Series platforms so that you can deploy the right application, at the right time, in the right place. The hardware and software decoupling provided by the service-ready deployment model enables applications to be provisioned on the module at the time of its installation or remotely anytime thereafter. Supported solutions include Cisco Wide Area Application Services (WAAS), Cisco Unity Express, Cisco Application Extension Platform (AXP), Cisco Wireless LAN Controller (WLC), Cisco Video Surveillance, and other applications under development. The Service Ready Engine enables organizations of various sizes to future-proof their network by allowing them to quickly deploy new branch-office applications without deploying new hardware, reducing the cost of rolling out branch-office services. Organizations today face several unique wide area network (WAN) challenges: the need to provide employees with constant access to centrally located information, the requirement to continuously back up and replicate mission-critical data to centrally managed data centers, the desire to provide satisfactory experience for IP phone and video communication, and the mandate to control bandwidth costs without sacrificing application availability and performance. Cisco WAAS Express is designed to help organizations address these challenges. Cisco WAAS Express extends the Cisco WAAS product portfoliowith a small-footprint, cost-effective IOS-based software solution integrated into the ISR G2 to offer bandwidth optimization and application acceleration capabilities. Cisco WAAS Express increases remote user productivity, reduces WAN bandwidth costs, and offers investment protection by interoperating with existing Cisco WAAS infrastructure. Cisco WAAS Express is unique in providing network transparency, improving deployment flexibility with on-demand service enablement, and integrating with native IOS-based services such as security, NetFlow, and QoS. Cisco WAAS Express is fully interoperable with WAAS on SM-SRE modules, WAAS appliances and can be managed by a common WAAS Central Manager. Cisco WAAS Express is available in IOS from version 15.1(2)T1. Further information on Cisco WAAS Express can be found at http://www.cisco.com/en/US/products/ps11211/index.html. As video becomes pervasive in an organization and more video devices are used, new demands are placed on the network. It can be challenging to accommodate video needs while reducing complexity, planning for capacity, and providing the best possible user experience. Traditional IP networks need to evolve to medianets to accommodate these changes. A medianet is an end-to-end IP architecture that helps to enable pervasive media experiences. The medianet architecture includes a smarter network, smarter endpoints, shared media services, cloud services, and shared media services. A medianet reduces total cost of ownership and scales video through features such as auto-configuration and media monitoring. At the same time, it helps to ensure a quality user experience while optimizing bandwidth use and efficiency. For more information on Medianet for 2900ISR, please go to http://www.cisco.com/en/US/netsol/ns1094/index.html. Network management applications are instrumental in lowering operating expenses (OpEx) while improving network availability by simplifying and automating many of the day-to-day tasks associated with managing an end-to-end network. Day-one device support provides immediate manageability support for the Integrated Services Router, enabling quick and easy deployment, monitoring, and troubleshooting from Cisco and third-party applications. Organizations rely on Cisco, third-party, and in-house developed network management applications to achieve their OpEx and productivity goals. Underpinning those applications are the embedded management features available in every Integrated Services Router. The new Integrated Services Routers continue a tradition of broad and deep manageability features such as IP service-level agreement (IP SLA), Cisco IOS Embedded Event Manager (EEM), and NetFlow which allow you to know the status of your network at all times. These features, along with Simple Network Management Protocol (SNMP) and syslog, enable your organization’s management applications. Ethernet, 802.1q VLAN, Point-to-Point Protocol (PPP), Multilink Point-to-Point Protocol (MLPPP), Frame Relay, Multilink Frame Relay (MLFR) (FR.15 and FR.16), High-Level Data Link Control (HDLC), Serial (RS-232, RS-449, X.21, V.35, and EIA-530), Point-to-Point Protocol over Ethernet (PPPoE), and ATM. The Web Services Management Agent (WSMA) defines a mechanism through which you can manage a network device, retrieve configuration data information, and upload and manipulate new configuration data. WSMA uses XML-based data encoding that is transported by the Simple Object Access Protocol (SOAP) for the configuration data and protocol messages. Cisco IOS Embedded Event Manager (EEM) is a distributed and customized approach to event detection and recovery offered directly in a Cisco IOS Software device. It offers the ability to monitor events and take informational, corrective, or any desired EEM action when the monitored events occur or when a threshold is reached. Cisco IOS IP Service-Level Agreements (SLAs) enable you to assure new business-critical IP applications, as well as IP services that use data, voice, and video in an IP network. Cisco 2900 Series Integrated Services Routers also support SNMP, Remote Monitoring (RMON), syslog, NetFlow, and TR-069 in addition to the embedded management features previously mentioned. Cisco Configuration Professional is a GUI device-management tool for Cisco IOS Software-based access routers. This tool simplifies router, security, unified communications, wireless, WAN, and basic LAN configuration through easy-to-use wizards. CiscoWorks LAN Management Solution (LMS) is a suite of integrated applications for simplifying day-to-day management of a Cisco end-to-end network, lowering OpEx while increasing network availability. CiscoWorks LMS offers network managers an easy-to-use web-based interface for configuring, administering, and troubleshooting the Cisco Integrated Services Routers, using new instrumentation such as Cisco IOS EEM Generic Online Diagnostics (GOLD). In addition to supporting basic platform services of the Integrated Services Router, CiscoWorks also provides added-value support for the Cisco Services Ready Engine, enabling the management and distribution of software images to the SRE, thereby reducing the time and complexities associated with image management. CiscoWorks Network Compliance Manager (NCM) tracks and regulates configuration and software changes throughout a multivendor network infrastructure. It provides superior visibility into network changes and can track compliance with a broad variety of regulatory, IT, corporate governance, and technology requirements. Cisco Security Manager is a leading enterprise-class application for managing security. It delivers provisioning of firewall, VPN, and intrusion-prevention-system (IPS) services across Cisco routers, security appliances, and switch service modules. The suite also includes the Cisco Security Monitoring, Analysis and Response System (Cisco Security MARS) for monitoring and mitigation. Cisco Unified Provisioning Manager provides a reliable and scalable web-based solution for managing a company's crucial next-generation communications services. It manages unified communications services in an integrated IP telephony, voicemail, and messaging environment. Easily manage Cisco IOS Software activation and licenses for a wide range of Cisco platforms running Cisco IOS Software as well as other operating systems with the secure client-server application Cisco License Manager. Cisco Configuration Engine is a secure network management product that provides zero-touch image and configuration distribution through centralized, template-based management.